There are many different ways to heat your home, whether it’s a gas furnace, wood fireplaces or pellet stoves. Wood pellet stoves like ours are a popular choice among homeowners because they put out a lot of heat and have relatively low operating costs. However, there are some disadvantages of using pellet stoves as well. 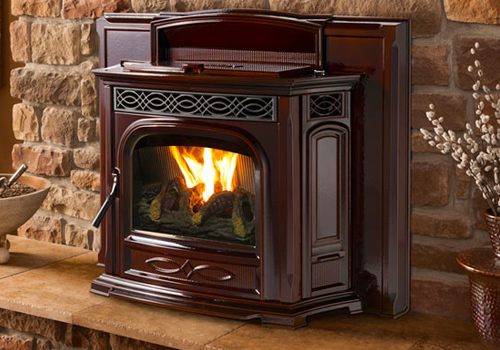 We find that pellet stoves are particularly popular with our customers in Columbia, MD. Read on to learn more about pellet stoves, including how they work and the advantages and disadvantages of using them. Every heat source uses some form of fuel to create heat. Pellet stoves use pellets made from compressed wood as their fuel source. These pellets are eco-friendly because they are made from compressed wood, plus they produce significantly less smoke and fumes than traditional firewood. Many people prefer pellet stoves over other heating options such as wood stoves, gas fireplaces or electric space heaters. Pellet stoves work by using electricity to ignite the pellets. Fresh air is pulled into the unit from your home, stoking the fire and allowing the pellets to burn effectively and evenly. The resulting gases are vented outside through a small pipe in the back of the stove. This pipe can be vented through a hole in the wall or an existing chimney. While all pellet stoves use the same wood pellets as fuel, there are two different types of pellet stoves: freestanding and inserts. Freestanding pellet stoves are stoves that are not reliant on an existing chimney or fireplace. They stand on their own. They can be placed anywhere you have room to fit them. Free-standing fireplaces are a great option for adding the beauty of a fireplace to a room that currently does not have one. Pellet stove inserts are designed to fit inside of existing masonry opening of wood fireplaces. Inserts are flush with the wall for a sleek, space-saving look, but they have to be mounted in a spot where there is an existing fireplace. It depends on your priorities and where you want to install it. While pellet stove inserts may fit with the existing configuration of your room, they have smaller hoppers and can be more difficult to clean. A freestanding pellet stove, on the other hand, takes up a decent chunk of space which could otherwise be used for furniture. The type of pellet stove you choose ultimately depends on that benefits that you are seeking. Pellet stoves cost less to operate than gas because pellets are relatively inexpensive. A 20-lb bag of pellets can provide constant heat for as long as 12 hours. Most people only need to fill the hopper once every couple days. Refilling a pellet stove is easy since all you need to do is pull the hopper out and fill it with pellets. Pellet stoves require a lot more maintenance than gas or electric furnaces, including weekly vacuuming of the burn pot and other cleaning requirements. Since pellet stoves have so many moving autonomous parts, they can be a bit noisy—especially when you’re just turning one on. While a fireplace can be used when the power is out, a pellet stove cannot since it uses electricity to ignite the pellets and vent the smoke. Pellet stoves produce a small flame when compared to wood stoves. Some homeowners feel that they don’t provide the same cozy fire feeling produced by woodburning fireplaces. Paying to have a pellet stove shipped to you can be expensive. Wood pellets stored and kept on hand for future use. You will need ample storage room to maintain a reasonable supply of pellets on hand. In some areas, local stores may not carry wood pellets. As a result, homeowners may have to pay the shipping cost to order them online. Want to learn more about pellet stoves? You may find our previous article to be helpful.